For a background to the growth of Baker Perkins’ export business, see Group Developments – In Summary - Exports. 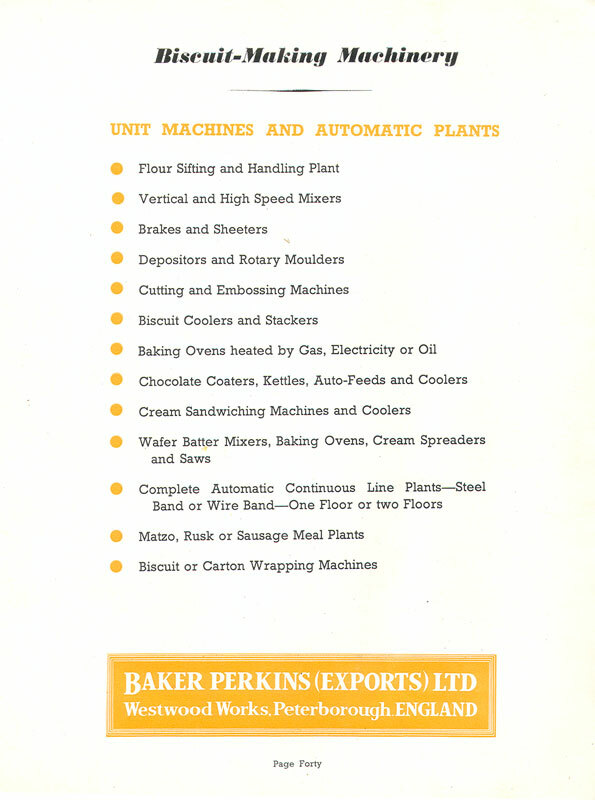 Baker Perkins (Exports) Ltd began operations in Westwood Works, Peterborough on 1st September 1950. The business world at this time was still suffering from the after-effects of WW2, with import restrictions and currency problems that varied from country to country and liable to sudden change. The Board recognised that more detailed knowledge of conditions in other countries was required and that more expertise and focus needed to be brought to bear. Significantly more technical and commercial training would be required if overseas business was to be engaged in profitably. A new company was formed to take over the entire responsibilities for overseas sales, with Harold Crowther as Managing director and H.S. 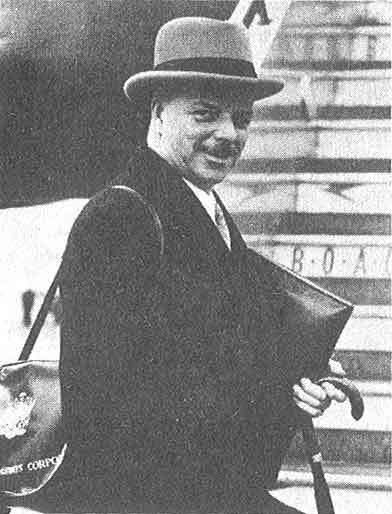 Hargreaves as his deputy. 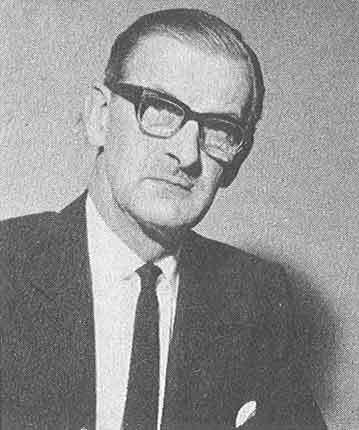 Young staff were recruited from within the Baker Perkins’ offices and the language problem was overcome by Harold Crowther’s organising foreign language courses. The new company soon became one of the group’s most valuable subsidiaries. Exports sales rose to record levels, eventually reaching one-third of the group’s turnover. With a view to improving the efficiency of the Export Company, it was decided to transfer the headquarters of the export business to London and the operation moved to Swallow Street, Piccadilly, London in 1956. 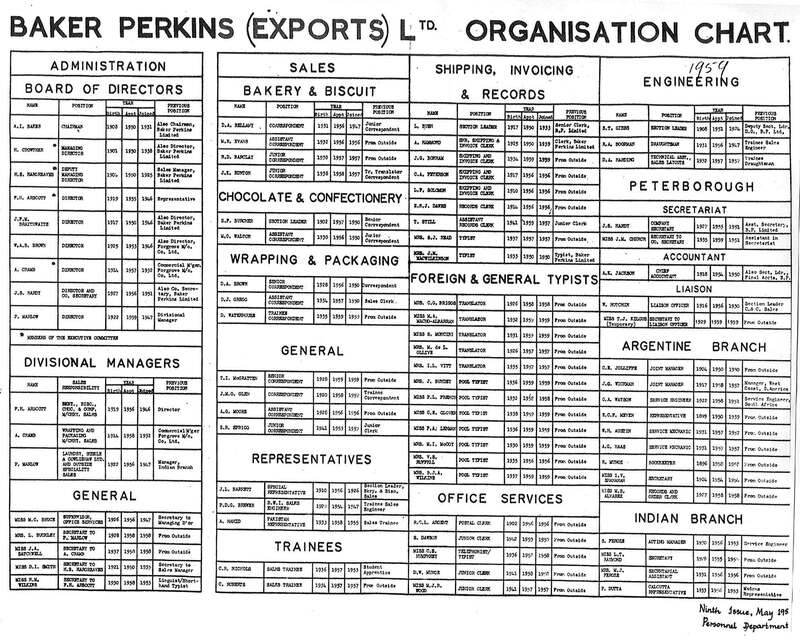 Baker Perkins (Exports) Ltd Organisation Chart - May 1959. (NOTE: To maximise legibility, we have deliberately made this chart larger than 800x600 pixels, so you will need to scroll around the full image using your keyboard's arrow keys or the on-screen horizontal and vertical scroll bars). 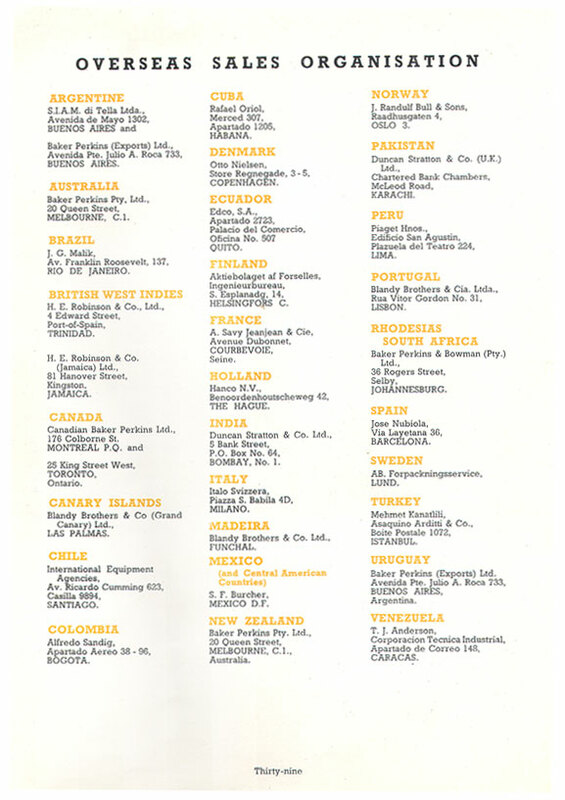 Overseas Sales Organisation in place at the end of the 1950s serving Baker Perkins' Biscuit Machinery Business. List of Biscuit-Making Machinery on offer at this time. (See also here). By 1961, eighty agents had been established in overseas countries and every year was seeing new sales records broken. This increasing level of business and lack of space prompted a move to larger offices in Stanhope Gate, Park Lane, London in 1961. "Harold Crowther’s long years of service in South America, his founding of Baker Perkins (Exports) Ltd, his war service making tank-landing craft and submarine engines with Davey Paxman Ltd and his membership of Baker Perkins’ Board and Board of Management for 13 of his 28 years with the company have all been detailed in obituary notices. This tribute is to the man himself. He was, above all, a man of action, hating indecision or delay. He was totally devoted to the company’s affairs and made many sacrifices of family and personal interests in order to fulfil his tasks. His knowledge of the company’s products was wide and many important Baker Perkins customers, especially in South America, owe much to his practical help, advice and encouragement which he gave to them in the early days of their enterprises. He was both a mechanical and production engineer, equally at home presiding over a designs committee or planning a works layout. He was the member of the Board of Management responsible for production matters and Works Director at Westwood Works for a number of years. He demanded much from those around him and his own example inspired them to give it. He encouraged many young men in the business and had no time for slackers. His imagination was most fertile and his capacity as a salesman was formidable. Quite apart from Baker Perkins’ business, he had a remarkable knowledge of engineering enterprises worldwide and a very large number of friends throughout the world. To be with him on a journey was an education in itself. Our sympathy goes out to Mrs Crowther and his two married daughters. It must have been some comfort to them to see friends from overseas gathered together with his immediate friends and colleagues to pay their last respects. This spoke eloquently of the respect and affection in which be was held". 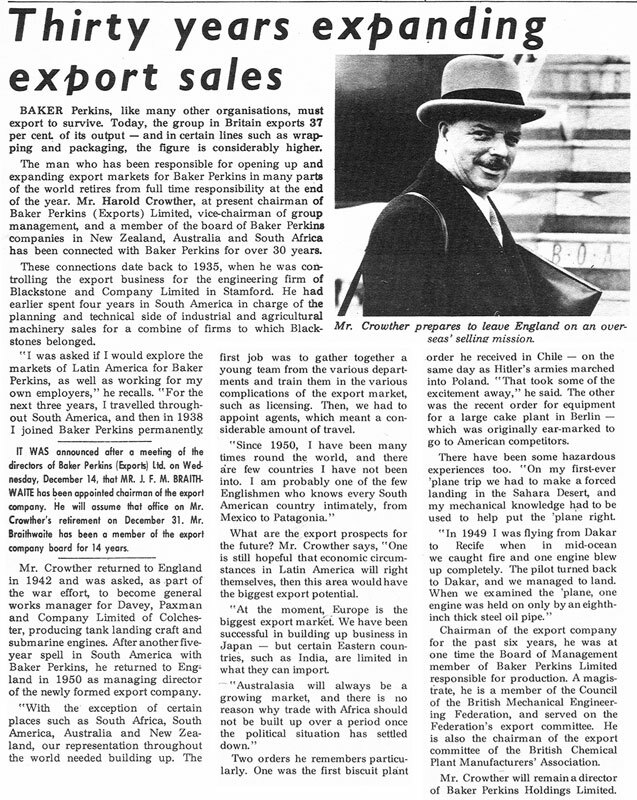 On January 1st 1969, a new company Baker Perkins International Ltd., came into being and Baker Perkins (Exports) stopped trading after 18 years’ life and over £47m worth of sales. This move was part of the re-organisation of the group’s overseas activities into six geographical regions. In 1971, the responsibility for international sales was given to the operating divisions and Baker Perkins International Ltd moved back to Westwood Works, Peterborough. (See also The Export Company). A more complete description of the day-to-day activities of the export business is given in The History of Baker Perkins International.